After buying a cheap Praktica BC1 for spares on Ebay I thought I would share with the world what I have learned about them. The reason I bought the BC1 was to provide a particular part for my partially non-working BCA. The fault with my BCA was that the auto winder would work with it. It turns out the fault was in the base of the camera. A lttle operating peg was missing, this peg operates a leaf switch that in turn switches the winder on. So off to Ebay and £5 quid later I was the proud owner of a non-functional BC1. While this was being delivered I got impatient and fashioned a new opeating peg out of a drawing pin. So when the BC1 arrived I thought I would have a look at it and try to figure out what is wrong. The fault with the BC1 is that it does not wind on. 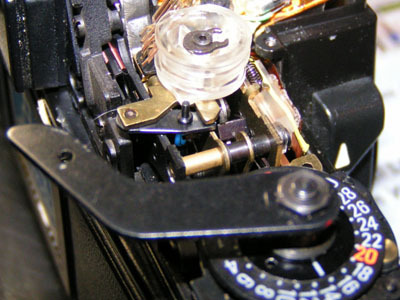 The lever moves and makes all the right sounds and feel but it will wind on again with out releasing the shutter, and when the shutter is released it only makes a tiny click and the shutter blades just jump a little. So first the bottom cover came off (four tiny screws) When winding the film on everything looks OK, put as the winder lever is released, the cranks and levers inside return to original position. IE they are not latching in the cocked position. If I hold the main crank down in the cocked position and fire the shutter it fires correctly. Given the huge complexity of the cranks and levers in this area I decided not to investigate more as the chances of getting all the levers, cranks and springs back in the right place would be very slim indeed.